Another hot and sunny start to the day as we said our goodbyes to our fellow cycle tourists. As usual, we were last to leave camp – we don’t like to rush these things! The day was spent travelling west on the Nantes-Brest Canal. Again, a fantastic cycling surface… until we reached Pontivy, when it deteriorated to loose gravel (I think we’d been spoilt by the previous excellent surface). The ride continued in the same vein as the day before – varied scenery, weirs, locks and pretty lockside houses. One part of the canal was being cleared of weeds and we were interested to see the unusual machines used to cut and remove the weeds for loading on to a waiting truck. It was along this part of the canal that Chris learned an important lesson! As it was hot and we were off road, she had decided, for the first time ever, to cycle without her helmet. However, just past Pontivy, a piece of wood got jammed between her tyre and mudguard, causing the front wheel to grind to a sudden halt and send her elegantly flying through the air to land – fortunately – on the grass at the side of the canal, but rather scarily close to a tree trunk. As Chris picked herself up off the floor, I rushed to the aid of Rosie (Chris’s bike – Rosie Ridgeback), who seemed to have come off worse, with a bent mudguard! Chris only had a badly bruised and swollen knee!!! Fortunately, I was able to repair Rosie by straightening her mudguard but there wasn’t a lot I could do for Chris, except to tell her that it might be advisable to put her helmet back on! To end the day, we came off the canal only to be faced with a very steep and testing hill. Sadly, we failed the test (! ), as by this time we were both melting in the heat and our energy levels were depleted after cycling 43 miles. After a quick phone call to Pete (from Chester) to check directions, we arrived at the campsite, which fortunately was only a couple of kilometres away. Our guidebook describes Mur de Bretagne as a ‘lively little town’ so we were somewhat surprised to find it completely dead! Pete went into town that evening to find somewhere to eat but everywhere was well and truly closed. Instead, he had to tuck in to his last emergency meal back at the campsite. We delved into our panniers and triumphantly came up with a couple of tuna meals. While in town, Pete discovered that it has in the past been one of the stages on the Tour de France and looking at one of the hills going out of the town, I can understand why. Fortunately, it wasn’t the road we had to take out of town! Looking at the hill left us with a feeling of awe and respect for the TDF cyclists. The following day was a rest/sightseeing day so we cycled into town to explore and buy some food. We were dismayed to find that the only shops selling food were a butcher and a baker, so still no fresh fruit and veg. Oh, for a banana or two!! However, we soon cheered up in the evening when the three of us shared a bottle of wine and plotted the next day’s route. The next morning, for breakfast, we munched our way through yesterday’s croissants, which were by now, stale and very chewy! Then we set off with Pete, as we were making for the same town. We headed out of town on the D35 and undulated (more hills!) our way to the medieval, walled hilltop town of Moncontour. After a little confusion, we eventually found the campsite on the outskirts of the town. Having set up camp, we wandered into town looking for some liquid refreshment and some supplies. Oh joy of joys, we spotted a Carrefour supermarket! We decided to explore the town first and shop later, so set off to look around. Moncontour is an interesting little town with a nice feel about it – it has ramparts, winding cobbled streets, ancient 16th and 18th century half-timbered houses and shops and businesses with attractive wrought iron picture signs hanging outside. In years gone by it was one of the main areas producing leather and linen, which brought prosperity to the town. We also brought prosperity to the town when we hit the supermarket and stocked up on lots of fresh food! With some dismay we realized that we’d gone a little overboard when we couldn’t fit our supplies into our daypacks and had to buy another bag! After some good food, good beer and good company that evening, we decided to move on to the coast the next day. 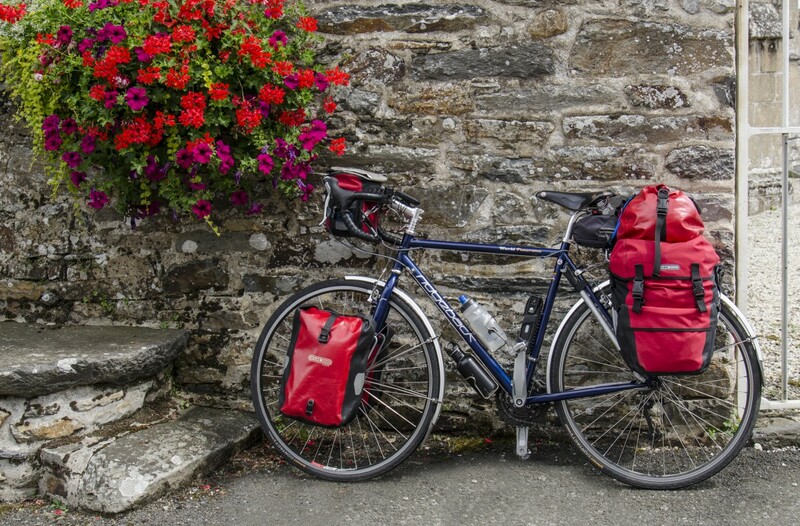 Categories: Bike, Camping, Cycle touring, cycling, France, Mike McEnnerney, photographer, Photography, PhotoLink Images, Tourism, Travel | Tags: Bicycle touring, Brittany, Cycle Camping, Cycle touring, cycle tourists, France, Moncontour, Nantes-Brest Canal, Pontivy, Travel, vacation | Permalink. I’m surprised that given the opportunity, neither of you gave ‘The Wall of Brittany’ a bit of an attempt……..and as for Chris taking her helmet off after knowing what happened to me….Tut Tut…a case of “It will never happent to me” I suspect..! !